What should we teach our children about religion? Learning about different worldviews is a critical component of education for democracy. Credit: Wikimedia Commons/RichardF. CC BY 3.0. At a time when the links between religion and politics are increasingly controversial one might ask, ‘so what?’ For many people religion carries associations of intolerance or extremism, and the school subject of RE has been seen as divisive and perhaps even anachronistic—the strange descendant of 1950s religious instruction and the state’s subsequent interest in community cohesion. However, there is much in this report that is fresh and challenging, especially its key recommendation that the curriculum be broadened to teach religions as one example of a range of different worldviews alongside non-religious frames such as atheism, agnosticism and humanism. The report defines a ‘worldview’ as a way of experiencing and responding to the world that is rooted in different beliefs, values and identities. In part this recognizes the increasing numbers of young people who identify as non-religious (what the academic literature refers to as ‘nots’), but it also stresses the importance of lived experience, context and choice in terms of how a commitment to a particular worldview is expressed. That said, the range of potential worldviews that are taught needs to be even broader than the Commission suggests. Their report gives examples such as agnosticism and atheism. The key feature of these positions is their attitude to theism, so if we take them as emblematic of non-religious worldviews then implicitly, the key shared feature of religions is their belief in God(s). In practice however, religions do much more than make a statement about the existence and nature of God, and non-religious worldviews are about much more than their atheism or agnosticism. In a landmark article published in the 1990s, the anthropologist David Gellner argued that ‘religions’ might concern themselves with a number of different spheres including legitimising the behavior of households (especially with regard to marriage choices and gender roles); sanctifying particular places or even whole nations (as in a ‘chosen people’); providing rites of passage for a life cycle such as baptism, confirmation and last rites; and providing moral codes, psychological reassurance and a ‘soteriology’ (an account of what occurs after death). Not all religions attempt to fill all of these functions, and those that do aren’t always successful in doing so. Gellner suggests that because many anthropologists have come from backgrounds in Abrahamic religions they do assume that a religion will cover them all, but he finds examples in Nepal and Japan where Buddhism coexists with other religious systems such as Hinduism and Shintoism. In these examples, different religions, each of which is internally coherent, takes on discrete functions for the same communities and individuals. Gellner’s argument has several important consequences for how we think about religion in a contemporary context, especially this one: the presumption that religions need to be exclusive emerges as an Abrahamic peculiarity. One can practice Shintoism and Buddhism or Daoism and Confucianism, but his schema also highlights the possibility of being, for example, a Jewish atheist—someone for whom the soteriology of Judaism has no attraction but who continues to participate in Jewish rites of passage. The Commission’s report briefly acknowledges that individuals may hold multiple worldviews, and Gellner’s schema gives us a way of describing how this might work in practice. Of course, mixing and matching between worldviews may be disapproved of by the state or by religious authorities, who may seek to align the different aspects of a person’s life to produce a totalizing frame in which all of a person’s actions can be seen as ‘Islamic’ or ‘Jewish.’ But this kind of policing isn’t inevitable or natural (or necessarily desirable). This is an empowering insight: once students begin to think of totalizing worldviews as just one possibility among many they can begin to assess whether they are good or bad and whether or how they wish to commit themselves to one or another. The Commission also highlights the failure of RE teaching to engage effectively with Hinduism, Sikhism and Buddhism. This inability is not just about the ‘alien’ content of these religions, but also about religions that occupy different functions and therefore challenge the Abrahamic presumption about what religion is. This is a crucial point. 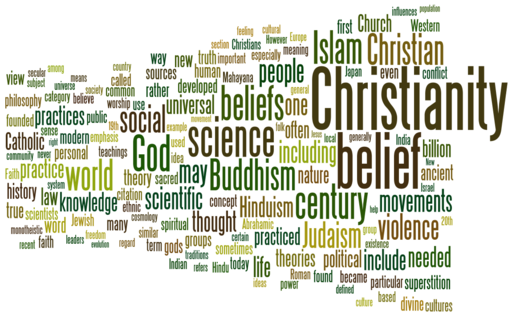 Non-religious worldviews can be about much more than a position on theism. The Commission does include humanism as a worldview, but I also have in mind the inclusion of political philosophies such as anarchism, fascism and communism. I do not, of course, envisage teachers advocating for any of these positions; teachers should not publicly recommend any of the worldviews they teach about. But including these political philosophies in a worldviews curriculum makes the point that the purpose of enquiry is to understand different perspectives and assess how worldviews are produced by different experiences, irrespective of whether we agree with the positions that are reached. The inclusion of political philosophies as worldviews would encourage students to think about the material requirements of transforming a philosophy, which gives moral rules to an individual, into a social group, one with common rules and a hierarchy. The Commission makes a distinction between institutionalized worldviews and those without an institutional foundation. I think this is important, but we need to develop this idea by asking how institutions maintain their members (for example through attraction and coercion), and who benefits from these institutional structures. In other words, we can ask some of the same questions of worldviews that we ask of states. RE has not traditionally investigated how religious groups are maintained over time (by controlling marriage, for instance) or how they influence politics, but these are central issues that need to be discussed. To presume that religion ‘naturally’ has no place in public life is to imagine that the belief in internalized private religion that is seen in some forms of Protestant Christianity is universal for all religions. But many versions of Christianity and Islam, for example, presume a much closer connection between religious doctrine and the state. If we were to consider political philosophies and religious traditions alongside one another as worldviews then this might stimulate students’ questions over where the boundaries of politics and religion actually lie in theory and in practice, and where political philosophies and religions appear to address the same kinds of problems. These observations illustrate the difficulties of defining the term ‘religion’ and generalizing from the assumptions we make about it that stem from Protestant Christian experience. The report comments on the absence of a disciplinary training for teachers of religious education, and one side-effect of this has been that British RE has been strangely divorced from developments in the academic study of religion at universities. This scholarship, which has been especially strong in Scandinavia and parts of the US, has long problematized the term ‘religion’ and interrogated the assumptions that it may invoke of discrete, institutionalized worldviews based around a scripture. Instead, it asks a broader and more challenging question: what do we gain or lose from characterizing a worldview as a religion? We should bear these caveats in mind when we design curricula for schools. But we can also treat these higher-order questions as an end in themselves for teaching: these are not just questions that curriculum designers need to ask, but fundamental questions for students and all others in society: why should we use the term religion in any given situation; who gets to define the term and who benefits from this definition; and is it right for this to be so? Public discussion of religion can often be reduced to binary divisions between people who label themselves as pro- or anti-. But even for the same individuals, ‘religion’ means quite different things in different contexts. If the first instinct of young people is to challenge the question—to ask ‘what do you mean by religion and why?’—we will have come a long way in promoting a healthier debate about this contentious subject.